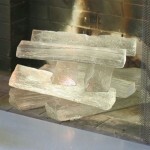 Usually when we think of a fireplace, we think of sharing it with friends and family. 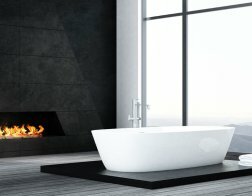 There is one type of fireplace, however, that is designed to enjoyed alone, in privacy: the bathroom fireplace. 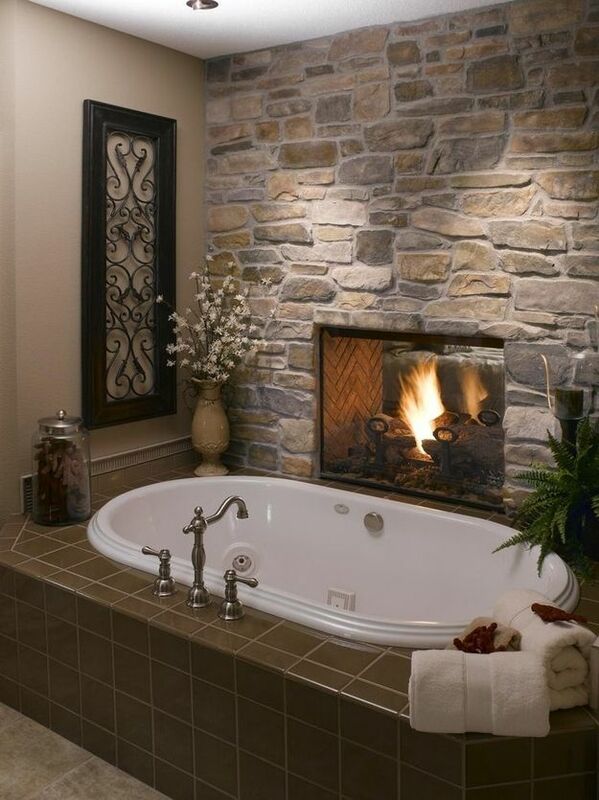 A bathroom fireplace is a personal and elegant indulgence. It is the ultimate for creating a spa-like retreat from the cares of the world and the demands of others. 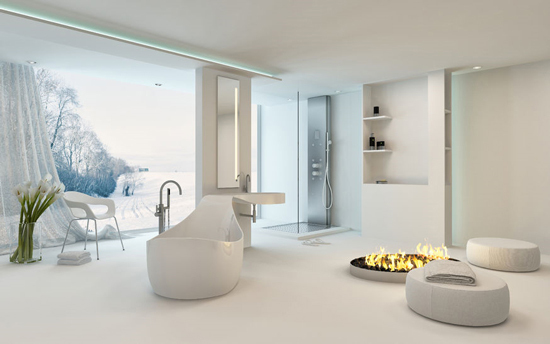 Be inspired by these examples of bathroom fireplaces. 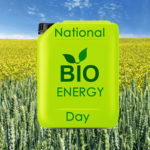 Some have wood burning fireplaces, wood-burning stoves, gas fireplaces, and ethanol fuel fireplaces. Some are in rustic homes, others are in traditional homes, and still others in modern homes. Some of the bathroom fireplaces are on one wall of the bathroom; others are in the corner of the room; others form a dividing wall between sections of the bathroom or between the bathroom and an adjoining bedroom; and a few are even in the midst of the floor. The most important design decision is to elevate the fireplace to eye-level so you can best see it and feel its warmth when you are in the bathtub. 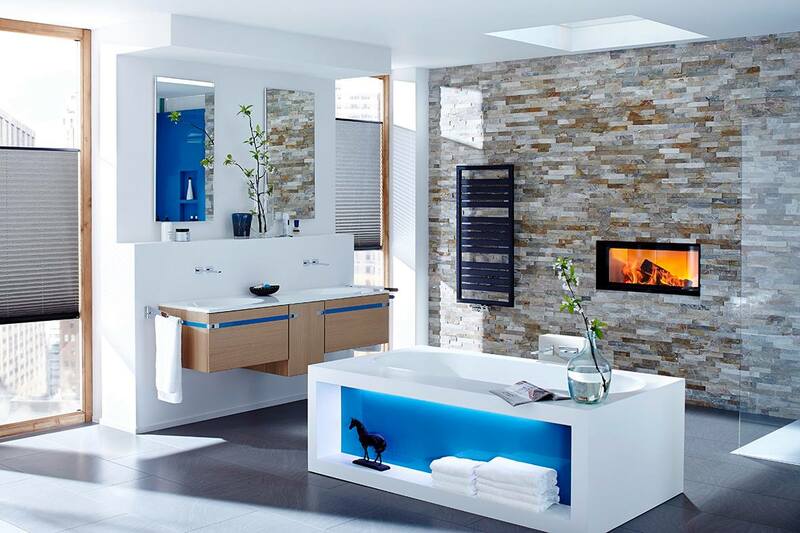 Keep the layout visually clean: A bathroom is the essence of cleanliness. 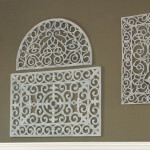 Don’t clutter your bathroom fireplace with extra “stuff”. 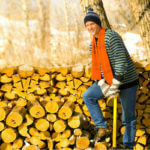 For example, keep the ash bucket for a wood burning fireplace out of sight. The traditional place for a fireplace is on a wall. 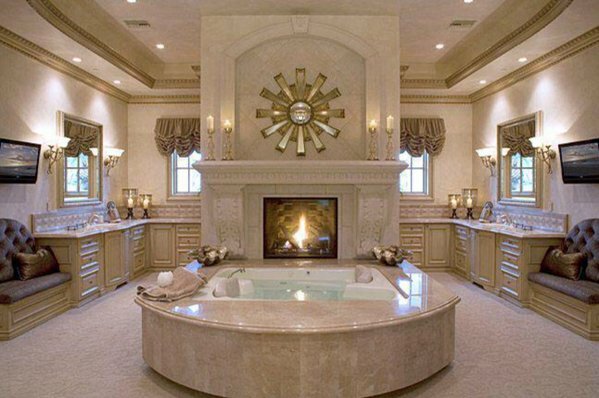 But these bathroom fireplaces are anything but ho-hum! Look at the width of the old rustic planks on the wall! The stone of the tub surround and shower walls also match the old stones of this wood-burning fireplace. Notice the potted pines on either side that continue the (elegant!) cabin feel. A room adjoining the master bedroom was turned into this luxury bathroom. Luckily, the room already had a fireplace, so the stand-alone tub was centered in the room to maximize the enjoyment of the fireplace. This modern style wood burning fireplace has sleek, contemporary lines. At one end of the wall into which it is set is a bench for lounging. At the other end is a large niche for firewood storage. 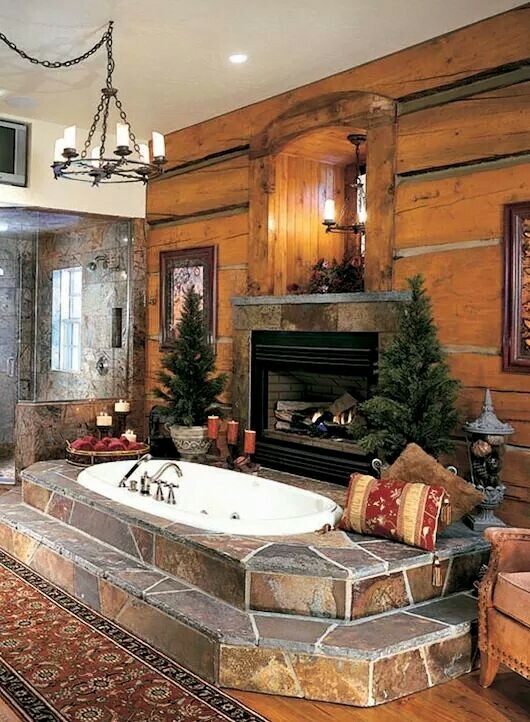 The firewood and the stone tile on the tub both provide texture to the room. Love the built-in, chromatherapy lighting on the side of the stand-alone, modern bathtub! The wall with the recessed electric fireplace is completely tiled with stone tiles. The glass enclosed shower on the right, like the tub, provides a good view of the fireplace. The arched fireplace surround is tiled with colors that match the wall and water. The arch is echoed in the oval tub and the arched tub surround. The sink bases compliment the wood base of the tub. 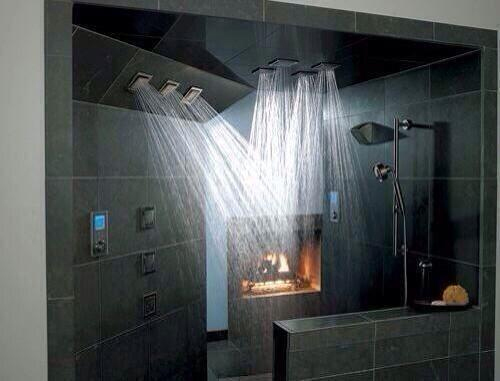 The elevated fireplace is perfectly placed for a soaking person. Love the contrast of fire and water! 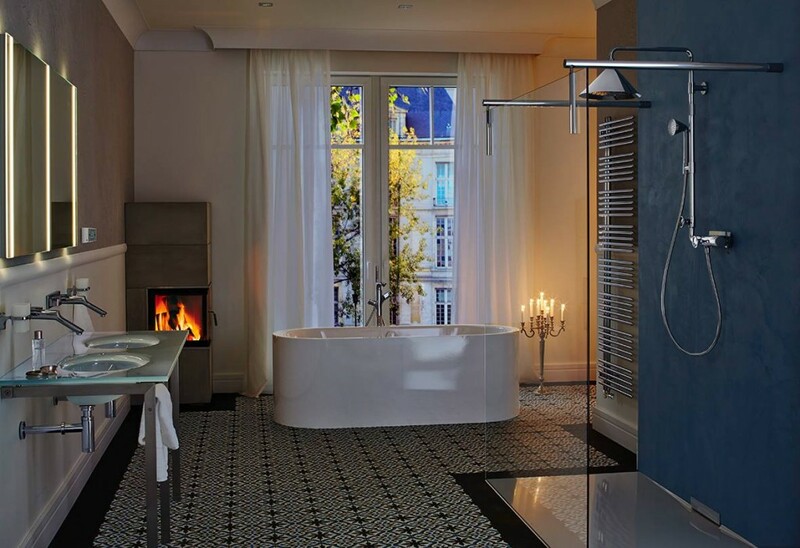 A fireplace is within view of this memorable rain shower room of this Lisbon hotel. An effervescent infinity bath with chromatherapy stands in front of a raised traditional fireplace. What’s chromatherapy? You can set the bath’s lighting to match your fireplace fire, your mood, or your bathroom’s color scheme. 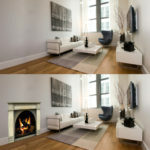 Two-sided fireplaces, such as those open on one side to a bedroom and on the other side to a bathroom, can have drafting issues. The solution is to include a chimney fan such as an Enervex fan in your design. Here’s how chimney fans work. This two-sided fireplace and its stone wall separates the bathroom and bedroom of this suite. Its elevated height not only makes it ideal to watch from the tub but also makes it just the right height to see from the bed. Set in a pony-wall, this fireplace divides the bedroom and the bath areas, but allows the light from the large bath window to flow through into the bedroom. The stand-alone tub separates the bathroom from the closet area of the room. This is a clean-lined take on a fireplace wall dividing the bedroom and bathroom. The glass enclosed shower, the tub and the bed all have an ideal view of the fireplace. 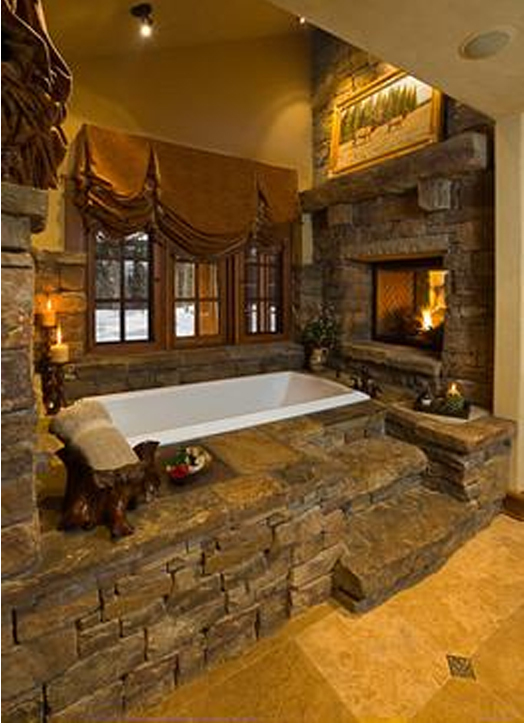 Stone dominates both the fireplace and the tub surround in the rustic bathroom fireplace. 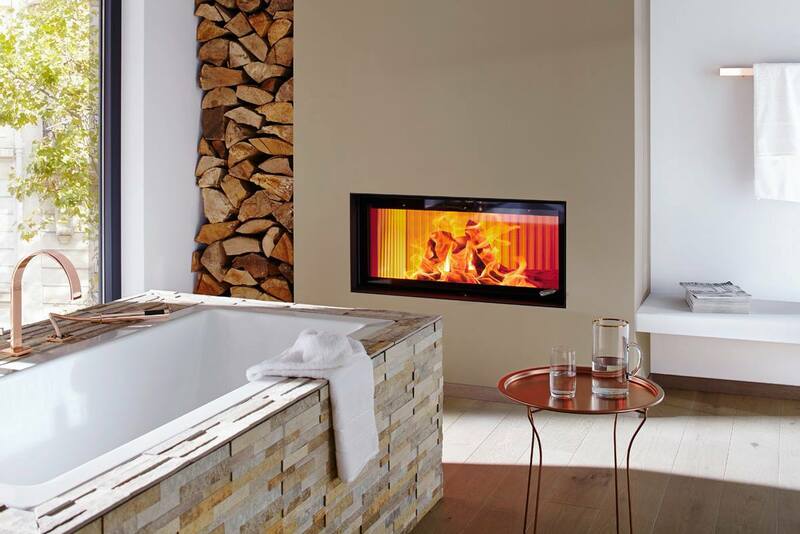 The two-sided fireplace shares its view with both the bedroom and the bathtub. 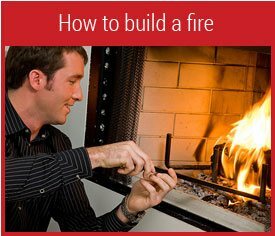 In smaller bathrooms, or when retrofitting existing bathrooms with a fireplace, a corner fireplace or wood stove is often the best solution. This bathroom would be special even without the corner fireplace (and even without the candelabrum on the floor!) 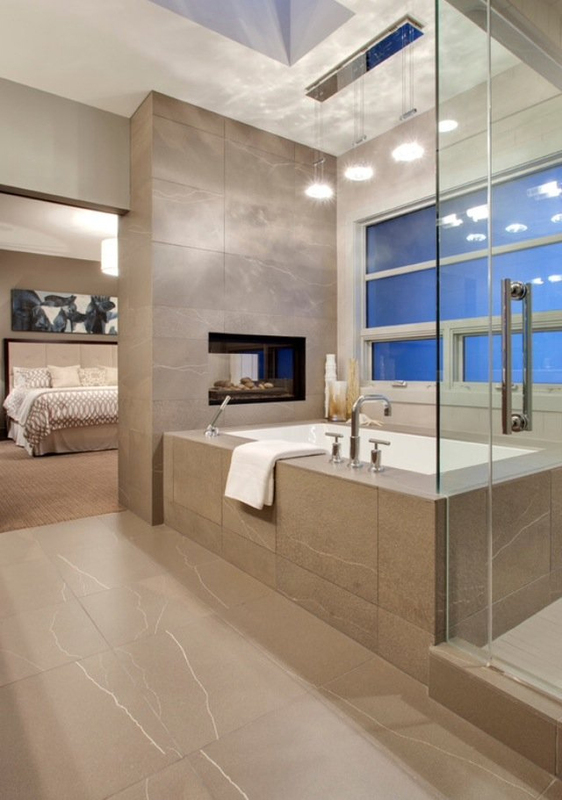 The view of the fireplace is great from the oval freestanding tub, glass walled shower, and glass sinks. 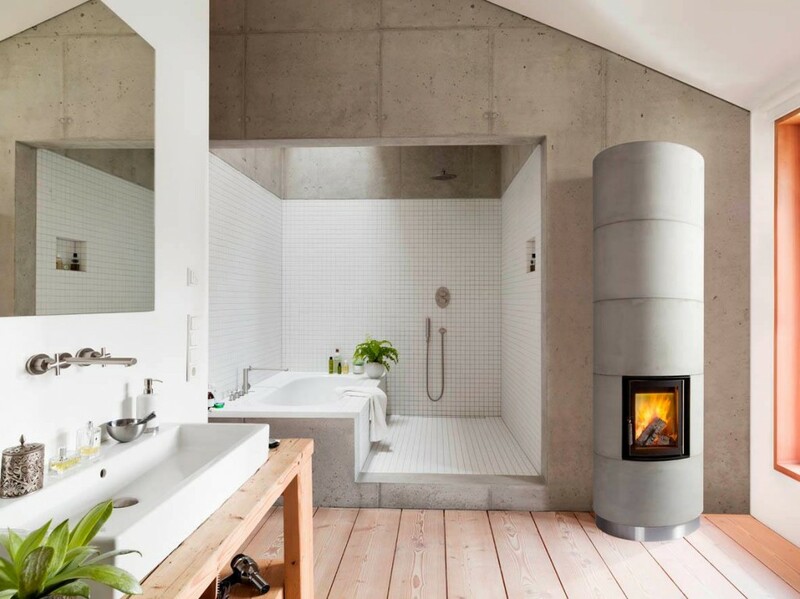 The most unusual but unforgettable placement of a bathroom fireplace is in the floor! 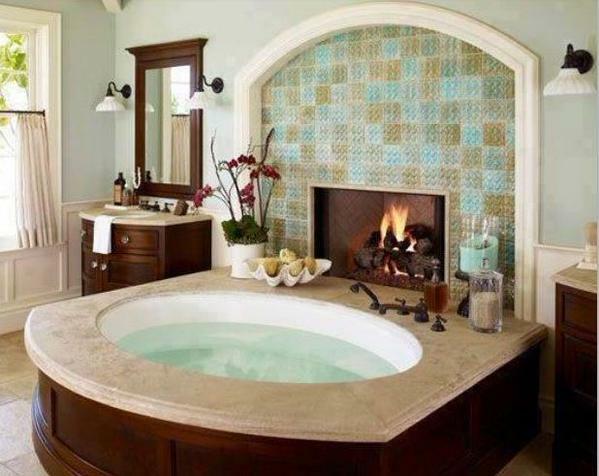 A round gas fireplace amid the floor of this bathroom even takes the focus away from the striking bathtub! When you design your dream house or remodel an existing bathroom, consider the advantages of a fireplace to brighten, warm, and extend the luxury of your bathroom.